In my opinion, children's books should not just tell a great story, but they should spark the imagination. This is by far my favorite children's book of the new year. I have shared it with several teachers and students at school. It was great fun watching them look around the room and see the owl in the wood grain on my door or the dragon that is on theirs. This book is great for ALL ages. I teach middle school and my students loved it. 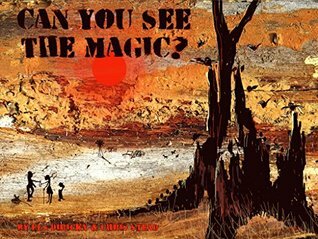 Chris Stead has taken the artwork created by Els Dirickx, and created a story where you must use your imagination to see the magic around you. In this story two young children convince their father to walk around the farm with them to see the magic. The father, like most adults tells them there is no such thing as magic. The children assure him there is. They look at rusty old cars, and burnt pieces of wood. This has reignited my already big imagination. I have always seen the magic in things. I used to drive my mother crazy with statements like, “Look at the face in the tile mom, it’s an old man with a droopy hat.” Our imagination served us well when we were growing up on our farm. We spent hours looking at the clouds and other items for the magic in them. I am already a fan of Chris Stead’s books. He worked his own magic when he paired up with this artist who creates something she calls Arikai Reverse art. The word Arikai is made from the names of two of her grandchildren Ari and Kai. This is a strange and fun adventure story. Morty likes to play pranks on his dad. One morning he goes outside to find a slug to put in his dad's shoe. Instead, he finds a strange flower. The pollen from it causes him to sneeze and he is transported to another planet. 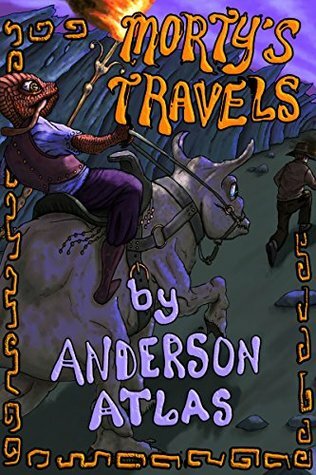 He meets some friendly adventures and even finds a pet. This would make a great bed-time story. The pictures are wonderful.